A viral video teaches a lesson not to count the chicks white the eggs are still yet to hatch or to be more exact, celebrate only when you had already crossed the finish line. This is the lesson hard learned by Oregon senior Tanguy Pepiot who had celebrated way earlier than he should have. 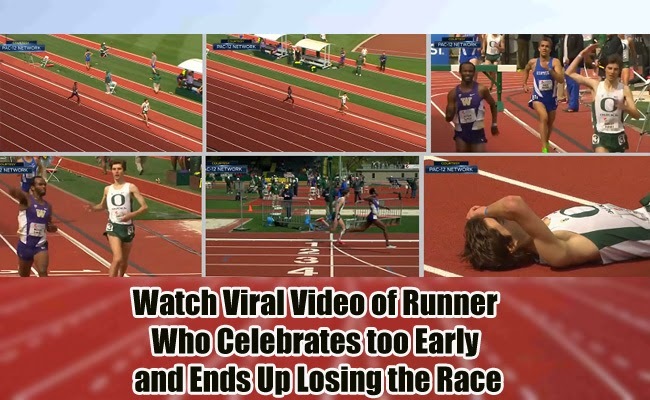 In the viral video, he was seen basking in the uproar of spectators in the grandstands of Hayward Field. Still around 10 meters from the finish line, Pepiot raised his hands to the crowds to encourage their cheers as he seemed so sure to win the race. About 3,400 people applauding as he nears the finish line in the steeplechase. The cheers turned into warning as Pepiot unknowingly had a close rival, Washington’s Meron Simon. What he thought was congratulatory applause was an alarm signaling him that someone is coming close, but it was too late when she checked the screens. Simon on the other also thought that Pepiot bagged the race already. He had also heard the crowd cheered and when he saw Pepiot raised his hands he realized the Oregon representative did not know he is coming. Simon then put all his energy to the last phase of the race and went straight to the finish line. Pepiot was shocked to see Simon pass by him in split seconds and lose the winning place. It is evident on Pepiot’s face that he had learned his lesson. At the end of the video, Simon is seem helping Pepiot stand. He expressed that it will be the first and the last time that this incident will happen to him.